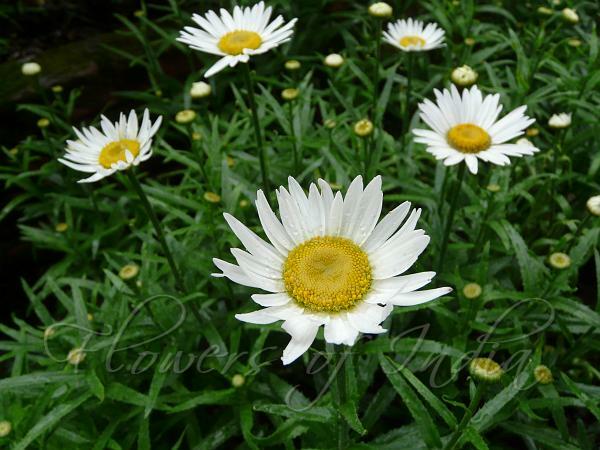 Shasta Daisy is a perennial garden plant, growing up to 2-3 ft tall. It grows into a bushy clump with foliage spreading about 18 inches across. Shasta daisies bloom over a long period from early summer to autumn with happy bright white flowerheads borne singly atop long green stems. The flower- heads are 2-5 in across with snow white ray flowers and golden yellow discs. The foliage grows in a mat with glossy dark green leaves 8-12 in long arranged in a basal rosette. The leaves are strap shaped, nearly evergreen, and rather thick. There are smaller leaves on the erect flowering stems. The names Shasta daisy has an interesting origin. 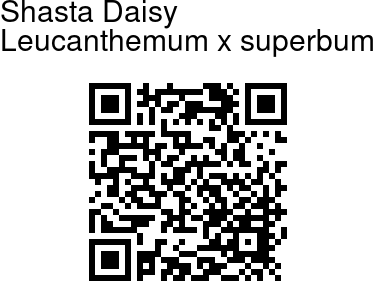 This daisy was created by Luther Burbank in 1890 in his experimental garden under the shadow of Mt. Shasta in northern California. He crossed L. maximum from the Spanish Pyrenees with C. lacustre from Portugal. Formerly classified in the genus Chrysanthemum, these daisies were transferred to their own genus of Leucanthemum because they lack some traits of true Chrysanthemums. Shasta daisies are characterized by a distinct and unpleasant odor, which makes them unusual amongst flowers.